Blog About a Dog: You Can Do It! The 2014 baseball season is winding down. Did you know the schedules for the 2015 season are already out? After reading of my fabulous and glutinous exploits you are probably spinning a plan in your head right now on how to pull off your own MLB/Hot Dog Road Trip next year. So what is keeping you?. Oh...right….time, cost and that separation from your significant other. I can help you plan your baseball bonanza by relating some insight from my own trip. First up, the time. Time off from work I can only give you this advice: your clock is running out. Yes, you need a job to pay for living. But you have to ask yourself if the time is right to ask for a sabbatical, extended leave without pay or other deal with your boss. Hate your job? Quit in April, do your road trip and start your new gig when you get back. Life is short dude, see a game. If you are wanting to catch all 30 MLB teams in their home ballparks plan on a minimum of 2 months. Yes, it took me 103 days, but I’m a slow learner. If you hit it hard you can to it in 60 or 70 days. Getting your significant other to agree to a lengthy absence? If he/she really cared for you they would let you live your dream. Best bet, take him/her with you or for at least a portion. What’s that you say? Your SO doesn’t like baseball? Dump them, they are a loser. I would never trust anyone that didn’t like baseball, you shouldn’t either. I saved $3,740.82 which for me is a boatload of money. How did I slice off all that fat? BIGGEST tip. Sleep in your car. Yes, it is a major inconvenience, but it will make or break the affordability of the trip. You get used to it, trust me. Get general admission tickets. So you won’t be able to see the player’s boogers in their noses. The view from up top is not so bad, and it saves you a bundle. In some cases you can get into an MLB game for under $5. Never pay for parking unless you have no choice. I used ballparksavvy.com to find where I could park for free. Sure, I had to walk over a mile on occasion, but it saved me hundreds. Plus, you need the exercise fatso. Now, things I COULD HAVE DONE MYSELF to save even more. I would have shaved $1,000 off of my expenses if I had spent EVERY night in my car or couch surfed. As it was I spent 12 nights in a motel. Don’t hate me because I am weak. That Starbuck’s habit had meaning. I used their wifi to update my blog, used their restroom to shave and other bathroom stuff and whiled away HOURS in there checking schedules etc. But, in retrospect, I could have grabbed a cup of coffee from McDonalds and used more public libraries to cut that cost in half. My GPS has an “avoid toll roads” option. Sometimes I did, but doing it always would have saved me clost to $100. I thought that is what gasoline tax is for anyway. The food cost was kept pretty low, perhaps I could have saved a bit on that but I was pretty frugal when it came to groceries. Things I had little or no control over the cost were gasoline (it is what it is, and getting a more fuel efficient car was not an option), hot dogs (it was for research after all) and beer (it was 20 bucks total man, lay off). The other transport costs were busses and trains to and from Toronto and New York City. While pricey, they actually saved me money (ever try to park in NYC?). So I would venture to say you could have a hot dog in all 30 MLB ballparks for about $4,000. That is subtracting the approximate cost of the Minor League games I attended. I could do the exact math but I am way too lazy for that. 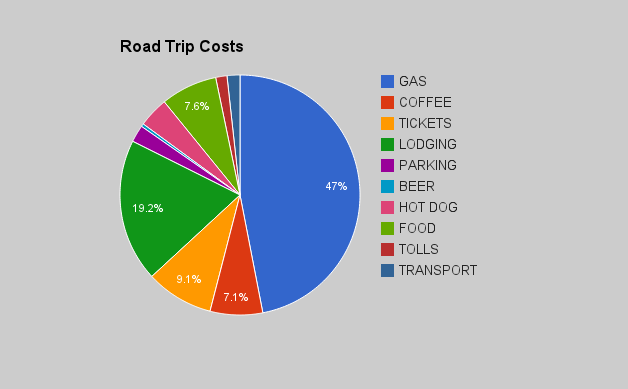 Here is a pie chart that displays my actual cost by percentage. As you can see, if you have a really fuel efficient vehicle it can save you a bundle. My RAV4 probably average about 25 MPG. Life really is short, and you will never regret stuffing your face with a loaded dog while sitting in the bleachers and watching the national pastime. Think of the stories you will have to tell. The clock is ticking and the time is now. So, what are your plans for next summer?